Whether you’re fishing freshwater for bass or inshore for redfish, casting topwater lures like Heddon’s spooks or Bomber’s Badonk-a-Donk can make for an exciting and rewarding day. Bouyant and durable, the secret to these topwater lures is mastering the “walk the dog” technique, which involves slightly twitching your rod during the retrieve to cause the lure to move in a side-to-side motion. Here are a few more tips to help you learn how to walk-the-dog like a pro in no time. Lures that are made for this technique tend to look like tapered cigars, like the Heddon Spook, XPS Slim Dog or Livingston Walking Boss. You’ll also want to make sure your lure is heavy enough to fly great distances when cast. The farther you cast the lure from the boat, the less likely the fish will see you as they chase the lure back during the retrieve. Your rod’s action will have a big impact on your ability to work a topwater lure. Soft action rods won’t cut it. Instead, go with a medium-heavy rod with a fast tips to get the best action from your lure. Braided line is my top choice here, as it has zero stretch, meaning when I move your rod tip an inch, the lure moves an inch. Braid also makes it possible to get some real “snap” in the action of my topwater lures, and makes hook sets much easier on long casts. 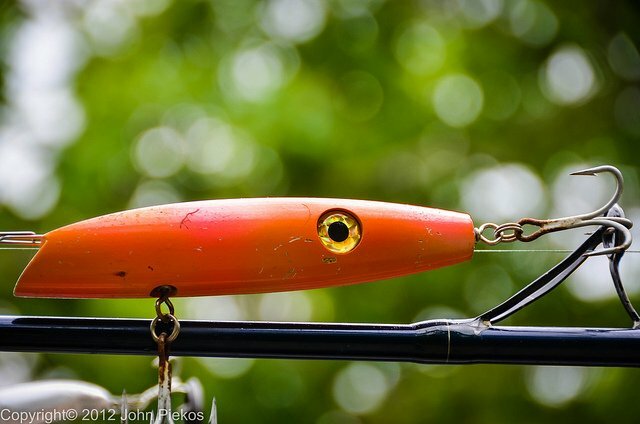 If a fish strikes and misses, make sure to keep the lure going. Often times, the fish will come back for a second strike as long as you continue the retrieve. However, I also like to keep a second rod and reel nerby, rigged with a soft plastic swimbait, so I can be to cast to the spot where the fish blew up. I can’t tell you how many times this backup combo has helped me land a fish when I’ve missed a strike on my topwater lure.